Villa See is a tiered, vacation residence that showcases contemporary, boxy architecture and posh tropical design. Interiors – with a constant light color scheme – are appointed with mostly chic, in-vogue furnishings and fixtures. Amenities are deliberately first rate – to assure each and every guest’s absolute convenience and diversion. 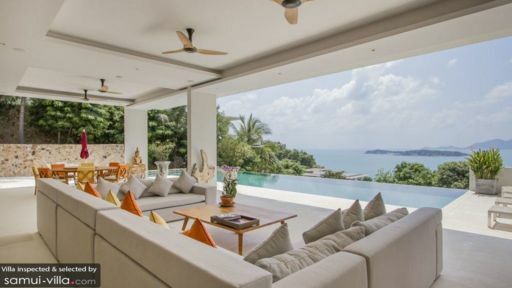 Nestled on a hillside towering above Choeng Mon Beach, Villa See offers you highland vacation living with a charm that’s genuinely high class. All of the villa’s five sunny, air-conditioned bedrooms are on the property’s lower tier. All five bedrooms have king-sized beds, as well as dedicated bathrooms with free-standing bathtubs and rain showers. Parallel to the edge of the property’s topmost tier exterior is the infinity pool. Dip into its alluring, glassy waters which optically projects you towards the sea. For some sun, you can lounge on ergonomic pool beds on the spacious, poolside stone deck. Right from the swimming pool is the semi-open, spacious and airy common area. More than half its space is devoted to the living area with its large and long, angled sofa. Here, you can all assemble for amusing and animated sharing and storytelling. Opposite is the dining area. On its laminated, timber wood table good for 10, you can all feast on authentic local specialties – as well as Western staples – concocted by the onsite chef at the fully-equipped, modern kitchen alongside the dinner table. At the back of the common area is a cinema room where you can replay your best-loved classic films. The villa also has a gym where you can do your regular exercises even while you’re on vacation. Tasked to render the villa’s regular services is a staff led by a manager supported by a personal guest assistant, a pool attendant, a gardener, as well by housekeepers and security personnel. In addition to the chef, a babysitter, a driver, a laundry helper and a spa therapist may, upon your request, be called in. However, their services will be charged separately. Bike, scooter, car and boat rentals are available. Villa See is based within the area of Choeng Mon Beach. Swim, snorkel, get into fun water sports in the bay or simply wander through the entire length of the soft, white sand coastline. As soon as the tide runs low, explore the island of Koh Fan Noi which you can easily get to on foot. You should also, on a Wednesday, take advantage of the low prices on a whole array of items at the Walking Street’s Night Market.